Baptism is a sacred sacrament that every member of a Christian congregation has to go through. It is a sacrament that washes away the original sin; the person is baptized with holy water and the sacred chrism made of blessed olive oil and balsam is used on the infant or adult being baptized. This is a ceremony that is special to Christians; thus, a huge celebration is held to commemorate it. 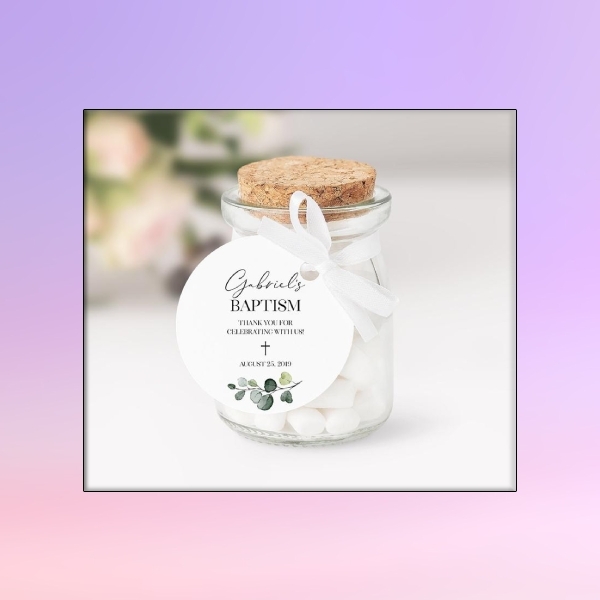 If you are looking for inspiration as to what token or favor to give to your guests, here are templates and examples of creative tags that you can use for your baptism celebration. 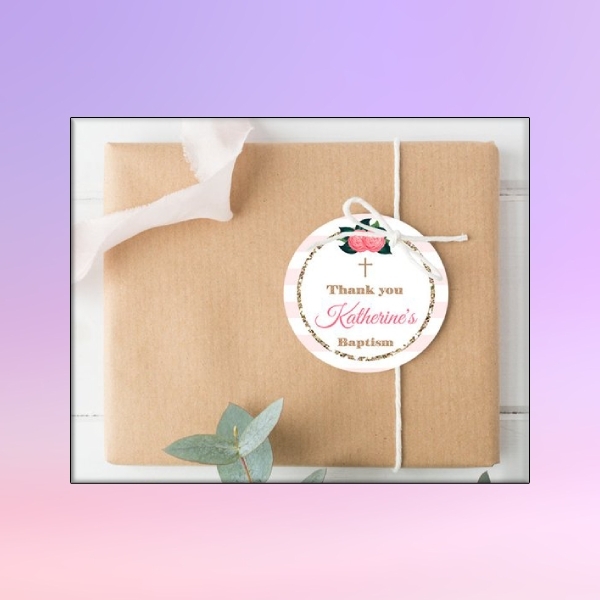 Aside from thinking about the baptism invitation that you need to send to your guests, you should also think about creative ways to express your gratitude to the people who have attended the event. The token you give to your guests should be useful but cheap; hence, a thank-you tag is a great option for this. You can also use this as an additional ornament to the actual favor that you give. Should you need a creative template for this, you can download this one and edit the contents. The overall packaging of your party favor should be creative and unique to make it stand out more. If the person being baptized is an infant, using images that relate to his or her preferences is the best design element to use. 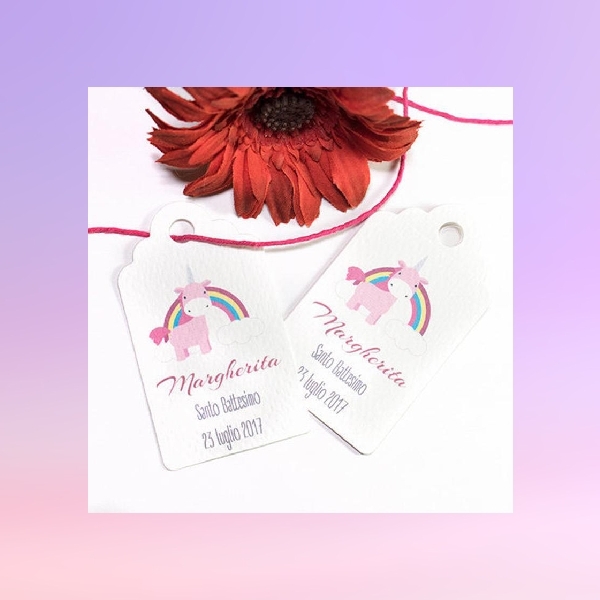 For example, this unicorn tag is perfect for the baptism reception of a baby girl. It has a simple layout but is amped up by the cute and colorful unicorn illustration and font. This is definitely a good reference should you decide to go for a similar theme for your tag. 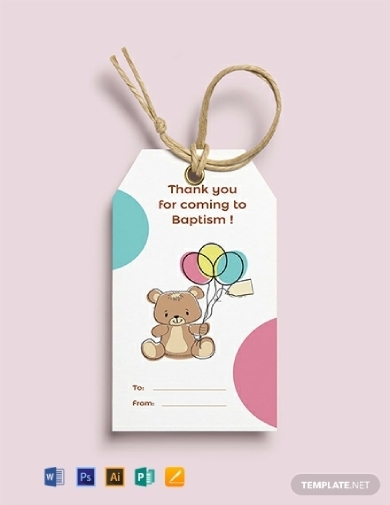 Express your gratitude to your guests through a baptism tag. The tag can have a simple layout or an over-the-top one, either option works just fine. If the reception has a theme, it is best to tailor the tag according to it. For example, this nautical baptism favor tag uses primary colors associated with the nautical theme along with its commonly used symbol. And to complement the overall color, a gold-colored font and accent designs are used. In addition, using a tie or thread that complements the color of the tag will make it look more consistent and appealing. 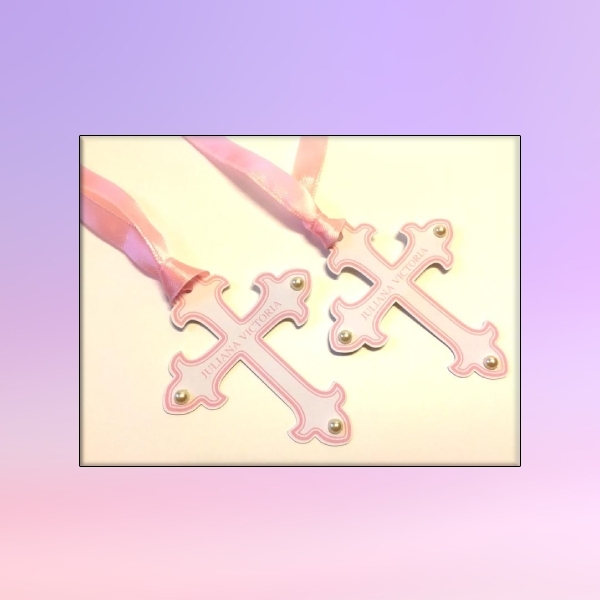 If you want to be unique and stay away from the usual tag shape and size, why not go for a baptism tag like this example? 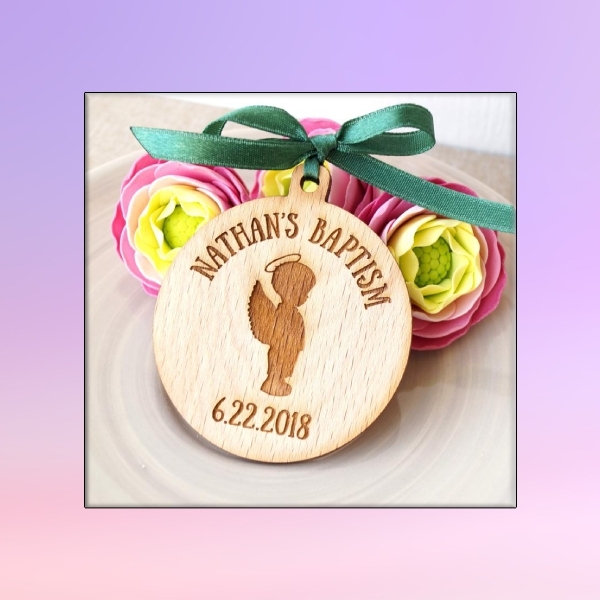 Although it has no other details aside from the name of the person being baptized, it is a perfect ornament to use for your party favor during the baptism reception. 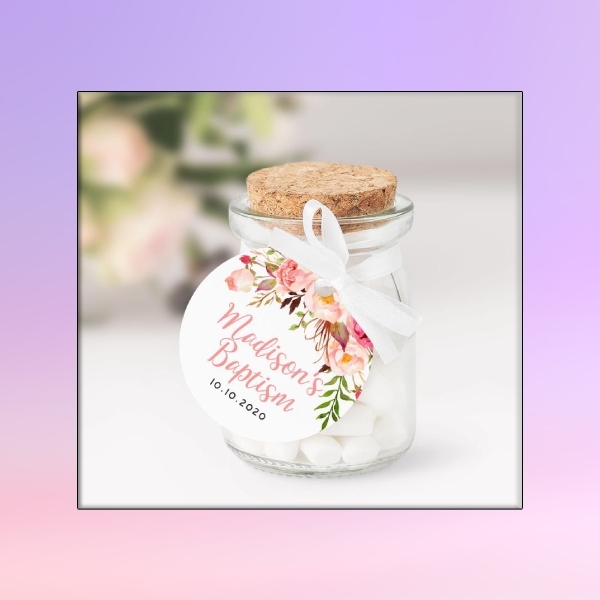 This tag example uses a tag shape in pink and gold accent designs; this is also perfect if you want to hang tags on the candles you use for the baptism ceremony. If you want to be unique, this is the perfect example to use as a guide when you create a baptism tag. Make sure you that the gifts you give to the godparents or the party favor you give to your guests are consistent with the event’s overall theme through using a tag. The gift tag can tie the knot between your overall theme since it is designed and created with the theme in mind. Looking at this example, you can clearly see and understand that the theme of the reception is pink or that the person being baptized is a girl. Since you will be using bright colors as the main design element, make sure that illustrations and other colors you use complement it well. 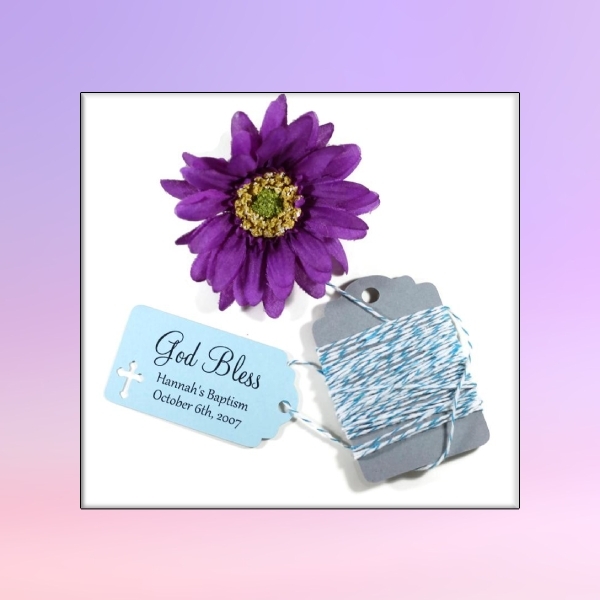 Go for a simple baptism tag with this rustic baptism tag as your main guide and reference. This example has a rustic and simple design with only watercolor-painted leaves as the main design element. And keeping the rustic vibe, it has used a dainty and simple font style in a basic color to make it look more sleek and neat. Using a tag designed like this will ensure that your message is conveyed clearly or a cute keepsake can be kept by the guests. Using the baptism tag as a way to send in well-wishes to your guests is totally possible. Similar to this example, you can design your tag to express your well-wishes, but instead of saying God bless, you can also say Thank you or Be blessed and other possible ways to say you’re thankful for their presence and that you’re praying for them. This tag example also has a cut-out cross on the side to tie it back to the religious and sacred ceremony of baptism. 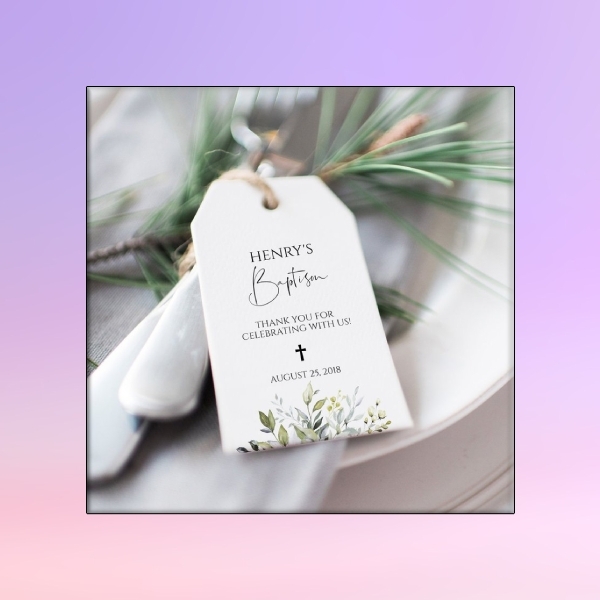 Make your party favor or token look more put together through the use of a well-designed tag. 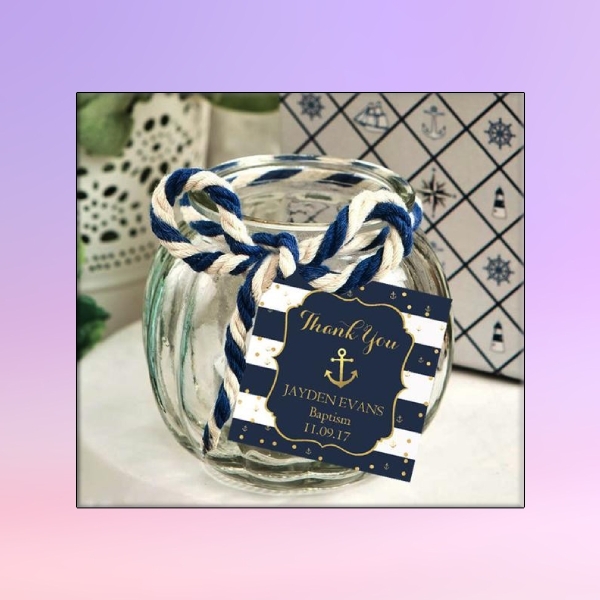 Regardless of the container of your party favor or token, it can look more beautiful if you hang a creative and artistic tag. Similar to this example, you can create a beautiful tag by including cute floral designs, colorful fonts that still complement that overall design, and a simple or intricate font style. If you want to go for something new, why not try out a wooden favor tag? Looking at this example you simply cannot deny how this wooden tag looks amazing and beautiful. Its overall design along with its nice brown finish makes the tag look captivating. This is perfect to use for a garden theme reception or outside party venue. If you want to achieve this finish or output, you can use this one as your reference. 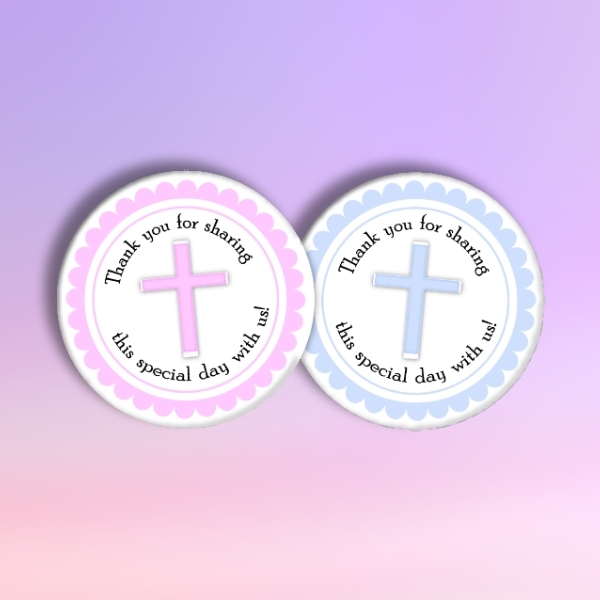 Give your guests a pretty and nicely designed tag to convey your appreciation and gratitude with a dainty baptism thank-you tag. If you are going for a rustic or nature-feels for your reception theme, this example is the perfect guide to use when you start designing and creating the tag. This example has the standard tag shape and uses a dainty leaves illustrations as the main design element. It also uses a cute and delicate font that makes everything look sleek and dainty. If you want to stick to a simple design and layout for your baptism tag, that’s totally okay. You can use a round layout and use simple lace cut-out designs with simple colors on the tag. In addition to that, you can also directly convey your message by directly saying thank you. If you are looking for inspiration on how to create a tag that is simple yet appealing, you can use this example as your inspiration.